SE Chambers are high performance chambers that can be used for stress screening applications. SE chambers come in various volumes and compressors making it suitable for stress screening applications of components, sub-assemblies and finished products in almost every industry. The chambers are designed with compressors varying from 2hp to 30hp capacity, delivering transition rates of 5 to 30°C per minute over wide range of temperature.Special baffle system combined with high air flow rates deliver better uniformity over the workspace compared to chambers with conventional air flow design. 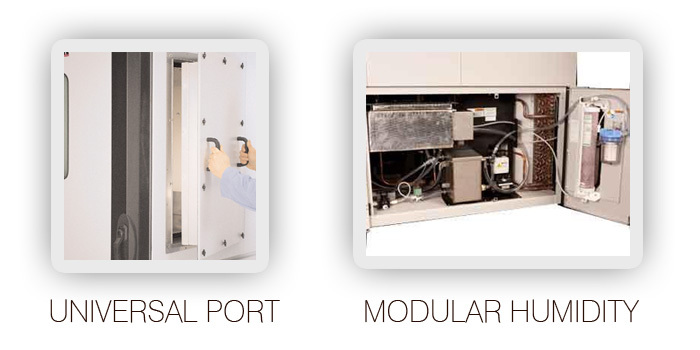 SE Series is the only chamber available in the market with modular humidity system. Humidity module can be added to a temperature chamber at site; making it a beneficial choice for users considering temperature chamber for the current requirements and plan for upgrading it to a humidity chamber in future. Large 12”-8800 touch screen controller in SE chamber is the most powerful controller in the industry. It is a windows based system, multi-level password, intuitive, user friendly and with best sampling data rate. Also a 40GB HDD enables storage of all test information for more than 10 years. Built in Digital refrigeration control and system monitoring is easy on troubleshooting and servicing. Ethernet and control through PC Software are some standard features of the controller and many options like data logging are available to serve varied needs in the industry. *Performance is based upon 60 Hz and 23.9°C (75°F) ambient air, and may vary slightly on 50 Hz power or at other ambient temperatures. The transition range is between +80°C to -20°C for Single Stage and +80°C to -40°C for cascade Systems. The transition rate mentioned is for temperature cycling unless stated with humidity operation. Please contact us for further details or suitable solution. *Performance is based upon 60 Hz and 23.9°C (75°F) ambient air, and may vary slightly on 50 Hz power or at other ambient temperatures. The transition range is +80°C to -40°C for cascade Systems. The transition rate mentioned is for temperature cycling unless stated with humidity operation. Please contact us for further details or suitable solution.